Homepage » Poker Tips » How to Win a Poker Tournament » Controlling the Early Stages of a Poker Tournament » To Slow Play in Poker or Not to Slow Play? Just to cover all bases a “slow play” in poker is when a player acts very weak by checking and calling when really they hold a very strong hand. The idea is that by disguising their strength they can lure their opponent into betting and committing into the pot before eventually making a raise later on in the hand. I am often asked about slow playing a hand in general. Many players I know automatically slow play if they get AA or KK. I also see a lot of slow playing online. Sometimes in some of the smaller freeze out tournaments it seems like everyone is playing back to front by slow playing their good hands and raising or pushing after the flop with weaker hands. As a general rule I do not advocate slow playing. That is not to say it is not a useful strategy from time to time in certain situations and against certain opponents, against the right type of opponent then it can be the best option to extract the most chips, but this is a minority of the time in my opinion. In my opinion you should always be raising with any premium hands you get. Like we have talked about one of the aims of playing a premium hand is to play against only one opponent to protect your position as favourite in the hand. To ensure this happens you have to bet and raise your premium hands to stop a multi-way pot developing. 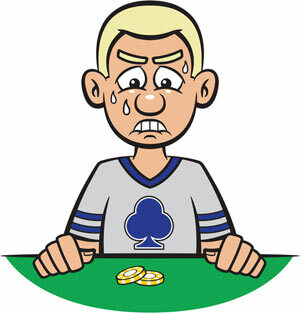 Many times online I’ve seen a player just call with KK letting multiple opponents into the hand with him and then an ace hits the flop and, wait for it … he/she then decides that now is the time to bet the flop hard or re-raise a bet, even though with multiple opponents it is very likely one of them has an Ace. Slow Playing isn’t the way to disguise the strength of your hand. This is done by making sure that you are not displaying any betting patterns to your opponents either by making a standard raise every time you enter the pot, or by mixing your raises and limps across your whole range of starting hands. You can’t just raise with premium hands and limp with your speculative hands all the time as a good opponent will soon spot that and will know you have a premium hand when you raise and just fold and take advantage of you when you limp knowing you are weak. You must from time to time raise with a speculative hand and make sure that your opponents see that you raised with a weaker hand, or very occasionally limp or just call a raise with a premium hand and make sure they see that also. This way they cannot read you by the size of your bet/raise. I’ve seen way to many hands like AA, KK or even QQ slow played and get beaten more often than not. For example I was playing a small 30 player freeze out about a week ago and it was early. Player A had just called from middle position and player B called from the cutoff. The button and small blind folded and the big blind called so it was 3 to see a flop of Q 7 5 with 2 spades. Player A checks and player B bets the pot and the big blind folds. Player A calls and the 10 of spades hits the turn. Player A checks again and player B bets the pot again. Player A waits about 15 of the allotted 20 seconds and calls. A deuce(diamond) hits the river and player A checks for a third time and player B fires out another bet, this time about 1/3 of the pot. Player A instantly moves all in and player B calls. Player A had AA and player B had Ks 9s for the flush. Player A trying to slow play his aces got taught a lesson! By slow playing, he gave his opponent 5 cheap cards to try and make a hand to crack his aces. It’s like standing up and saying to your opponent punch me in the stomach and see if you can knock me down, no wait hold on… actually punch me in the stomach five times. Which one do you think has the better chance of knocking you down? Another situation I see often is someone with a premium hand slow plays it before the flop because they are scared that no one will call them if they raise and their premium hand will be wasted. By doing so they allow multiple players into the pot and then the flop delivers a scary board with multiple cards of the same suit, or connected cards for a straight. Worried by the dangerous flop they then try to bet to get people out of the pot, but the problem with this is that you will find that too many times weak players love to chase and they will call you down right to the river. The time to get weak hands out of the hand is before the flop, or at least make them pay to get in and then if they are playing bad hands then you will have a bigger pot that you will win more often than not with premium hands. In summary there are not too many situations where I would slow play a hand. There are situations where slow playing is useful but they are few and far between. I think the risk is just too high.